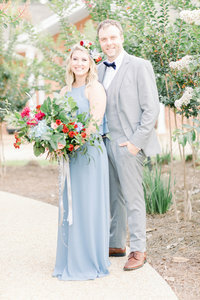 A stunning blue gown and a sharp gray suit may be the first things you notice from this sweet engagement session. But just wait—it gets even better! 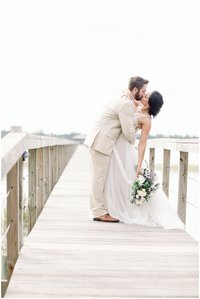 Taylor and Jay’s story began with a first date at the St. Marks Lighthouse. Side by side they lingered together, talking about anything and everything as the hours passed and the sun dipped below the horizon. After that dreamy and romantic evening, these two were inseparable. They spent their days fishing, enjoying quality time with their precious fur babies, and watching the sun go down—a sweet activity that would forever be a little extra special to the two of them and their love story. It didn’t take long for them to decide they wanted to spend the rest of their lives together. They could feel it in their bones. They just knew! And according to Taylor, it didn’t hurt that Jay knew how to make her coffee just right. That’s saying something because he doesn’t even drink coffee! You don’t get much more “keeper” than that. When it came time to take the next step in their relationship, Jay hit the nail on the head. He planned a photo session at the place where it all began—the St. Marks Lighthouse! It was a little suspicious that they rode in separate cars to their second location for the shoot, but luckily for Jay, Taylor didn’t think anything of it! When Taylor got out of the car to walk to the second location and meet up with Jay again, she saw something that brought tears to her eyes. Just around the corner, she saw a path of flower petals, candles, and the man of her dreams on one knee with a ring in his hand. He even brought champagne! We told you it got better! 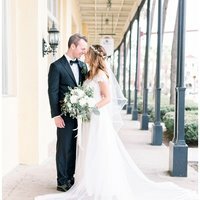 Taylor and Jay, we’re so honored that you chose us to celebrate your special day with you. And not just your wedding, but your engagement too! You two have such a bright and happy future ahead of you and we can’t wait to cheer you on as you become husband and wife!